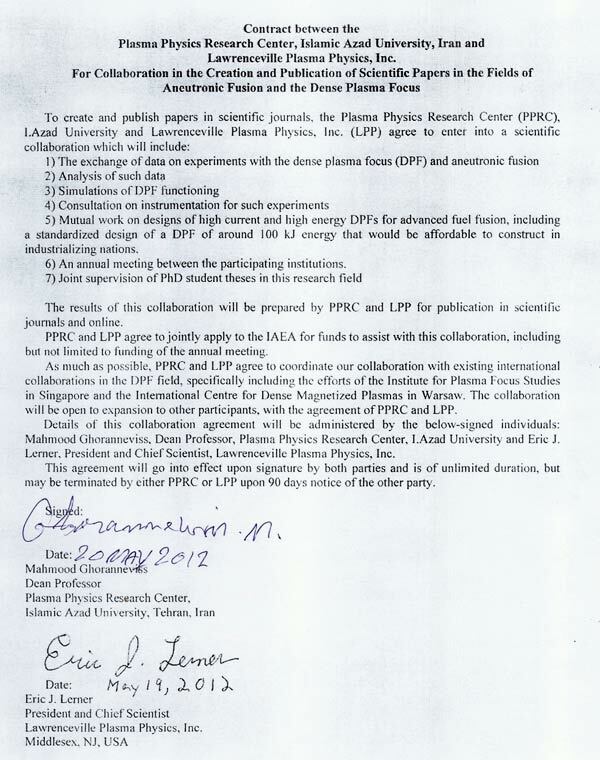 I see that Lawrenceville Plasma Physics is back in the news again with the announcement of a collaboration between LPP and an Iranian research institution. The collaboration agreement is for scientific publications on aneutronic fusion, which some sources claim could be a possible route to cheap, safe, clean energy. This blog believes the claim is the result of an over active imagination of a science fiction writer. The US Government is taking this agreement seriously with claims that President Obama’s Council of Advisors on Science & Technology have been briefed on this agreement. However, I believe that the efforts at LPP are more likely to be the flights of imagination of the lead researcher than any serious attempt at fusion. However, it is discomforting to see this nonsense elevated by this political manoeuvre by LPP. I can only hope it leads to the place being closed down. I should correct the above by saying we did brief PCAST (there is video, after all http://bit.ly/Mf0kXH, so pretty good evidence there! ), but we’ve made no claims regarding the response of the US government–We hope they’re taking this opportunity to collaborate at higher levels seriously, but we’ll have to keep following up. Thanks for the comment and clarification. I think you are proposing a beam-like light-ion fusion. Of course this will be an efficient source of fusion and this type of system is used regularly to produce neutrons in the oil industry. However, it is well known that the key problem with accelerator-based fusion (and with cold targets in general) is that fusion cross sections are many orders of magnitude lower than Coulomb interaction cross sections. Therefore the vast majority of ions end up expending their energy on bremsstrahlung and ionization of atoms of the target. Despite periodic reports in the popular press by scientists claiming to have invented “table-top” fusion machines, neutron generators have been around for half a century. These devices do not produce a net power output. See wikipedia for further information. However, I am happy to look at how your approach intends to overcome the well known issues. If you can send me a paper or proposal I will review and comment. Hi, Mike, I’m sorry not to have seen your reply comment above until my Google Alert popped up your latest post. I would be happy to send you our papers, please email papers@LPPhysics.com and I will get them right back to you. I have not yet looked over the latest post, but can of course tell it is critical–That’s perfectly fine, we would rather have a healthy scientific debate than to have potential new technologies remain neglected. Rather, much better to prove them impossible as quickly as possible so we can focus on the probable. I sent you a mail. I look forward to the material. Please have a read of the new post, it is critical of the claims of LPP. However, it is not critical of the science carried out or the results. The results are in line with other Focus Devices. It just that there is no new physics here and the claims to have proved anything new or moved closer to Fusion is an insult to the many scientists who have spent the entire lives trying to make new discoveries. I would like you to spell out what exactly you are trying to prove.